This is a special widescreen edit of David Lynch’s DUNE that reintegrates footage from the Extended Cut, as well as some deleted scenes, while attempting to preserve Lynch’s vision. This is a special widescreen edit of David Lynch’s DUNE that reintegrates footage from the Extended Cut, as well as some deleted scenes, while attempting to preserve Lynch’s vision. Also, unfinished extended scenes have been fixed so eyes are digitally colored blue. The movie has been edited in such a way to preserve much of the sound and music of the theatrical cut, while incorporating Lynch’s scenes from the Extended Cut. Removed are the unapproved prologue paintings, male narrator, and fake “constructed” scenes from the Extended Cut. Various drafts of the script have been used to put scenes in a logical order. Our intent was to make an extended cut of DUNE that treats Mr. Lynch with respect. 2.35 NTSC Anamorphic, 8000kbps, 448khz AC3 5.1 surround audio. - No shots from the Theatrical Cut have been removed. - [CUT] Fake constructed scenes (such as Reverend Mother Mohiam’s trip to Arrakis) from the Extended Cut are not reintegrated. - [CUT] Redundant alternate takes from the Extended Cut are not reintegrated. - [CUT] Added paintings from the Extended Cut are not reintegrated. - [CUT] Male narrator from the Extended Cut is not reintegrated. Irulan narration only. - [CUT] Music changes from the Extended Cut are not reintegrated or, at the very least, toned down. - [CUT] Some trims or ambient sound effect changes have been made to the Extended Cut scenes in order to mesh properly with the Theatrical Cut. - Lynch scenes from the Extended Cut reintegrated. - Some deleted Lynch scenes have been reintegrated. - Eyes have been digitally colored blue in the added unfinished scenes from the Extended Cut and deleted scenes. - Scenes have been digitally cleaned (frame by frame) to minimize evident scratches and dirt. - Some music and sound effects have been added to accomodate transitions, rough deleted scenes, or to help scenes from the Extended Cut mesh properly with the Theatrical scenes. - Although the Extended Cut dialogue from the Guild Navigator is used, the Extended Cut music is toned down and the original Theatrical ambient sound effects have been recreated. - In the Extended Cut DVD, the background music is out of synch in the extended scene when Reverend Mother Helen Mohiam returns with her report to the Emporer. Audio from a television version (converted to 5.1 audio) has been used here so the music synchs properly. - The scene of the House Shield activating has been moved in order to accomodate the restored scene of Thufir talking to Leto about Duncan. - Some scenes (such as the worm drowning sequence) have been moved to more logical places in the film. Various drafts of the script have been used as a guide for certain scenes’ chronology. Dune is a literary science fiction masterpiece whose definitive cinematic portrayal is still elusive. Much can be said about the aborted attempts made at bringing the first novel to the screen, and while the Sci-Fi Channel’s 2000 miniseries may have been a bit more accurate in the events depicted within its runtime, David Lynch’s 1984 theatrical effort is still a fascinating piece of work. Enter fan editor PhineasBG. 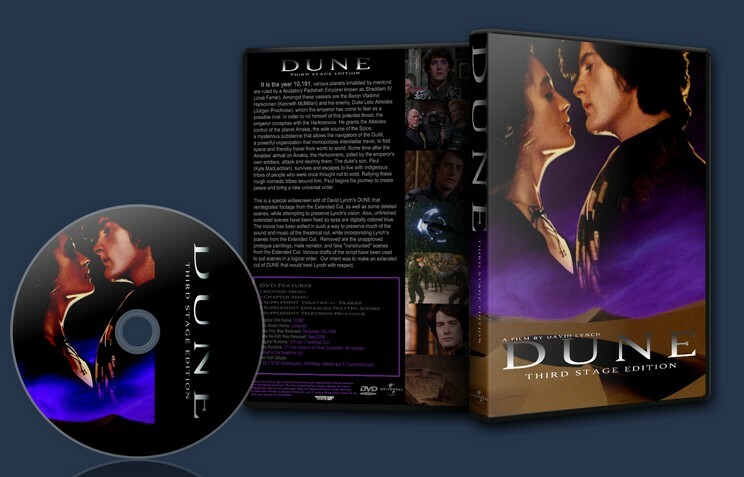 While there are several other Dune fan edits out there, most attempt to bring the film more in line with the novel, while one attempts to recreate what the pre-release workprint might have been like. The Third Stage Edition is something else entirely. Working from a widely-available shooting script and utilizing footage from both cuts and the selection of deleted scenes from the Special Edition DVD released in 2006, Third Stage aims to restore what is presumed to be Lynch’s actual director’s cut. Being the first fan edit I ever got my hands on, I was plenty excited to experience it, and I was not disappointed. The story now feels complete and epic, coming in just under 3 hours but suffering none of the repetition of the extended edition. Most of the deleted scenes restored are incredibly welcome, most especially the extended bits of the climax, for example the death of Thufir Hawat and Paul claiming Irulan as his wife. There are still problems inherent to Lynch’s version, which include the incredibly short amount of time Paul and Chani fall in love, and the pacing around Jessica’s taking of the Water of Life, but with no surviving examples of that footage, PhineasBG did his best, and his best is still wonderful. Even only being available on DVD, the picture and sound quality are surprisingly good for its age. Black levels are inconsistent, but the picture retains its color and has pretty good resolution for the format, having been sourced from 720p. The extended edition footage, long missing the blue-within-blue eye FX, has been restored digitally. No more Fremen continuity errors. Deleted scenes are still a bit rough and scratchy compared to the rest of the picture, but again, this is the way it is when the source footage is unrestored. I can’t expect everyone to be Harmy. The sound mix is deep and bassy, enough to shake the house when turned up. Some people aren’t a fan of this, but I love hearing the speakers rumble. Another big thing to note is that whenever possible, the theatrical cut audio is used on the sountrack, as the extended edition made some rather nonsense changes to the audio that frankly left me scratching my head. Bravo, PhineasBG. i love dune and had been after this version for a while. so after getting my hands on this i watched it that night. i love this edit but i loved the alternative redux more. i love how this cut is closer to Davids version of dune more than the studios. the only real problem i have with this edit is the quality is a little rough but you can only use what ever you have to work with. this is a real solid edit and really improves the movie greatly, it defiantly taking a spot next to the alternative redux and kicking the theatrical cut off the DVD shelf. Thanks so much! I also love Alternative Redux, which came long after this edit. If people like this edit, they will LOVE Alternative Redux! I just made an account to THANK YOU SO MUCH for making this...! 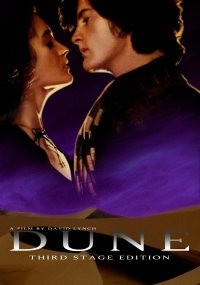 I haven't seen Dune in a long time. I love the book so much, so I just downloaded your version and at the same time, the 1080p theatrical cut. I watched the first ten minutes of both and instantly knew yours was going to be the more wonderful experience... even at the 480 resolution (I assume?). Thanks again for putting so much time and care into this edit. Really feels like I'm watching the intended version, flaws and pacing issues are no matter, because it's what the book feels like... a true edit for the fans! THANK YOU! After the midpoint there seemed to be much less integrated footage and this combined with the second half's leaps through time and space made this edit feel like two disjointed halves. In the original cut, 'Dune' flows like a beautiful unbroken dream sequence with Lynch using sound, montage, haunting voiceovers and mysterious visuals to tell his poetic story. But in this edit the first half's extra footage is integrated so well that it kind of breaks that spell, rendering the story in conventional yet more coherant terms. We see everything, every piece of the puzzle is revealed, every custom explained, every character fleshed out and every minute of life in Arakeen is shown. Then when Paul leaves Arakeen (At almost the exact middle) the edit appears to shift back into the mysterious dream structure with whole years passing with just a word from the voiceover. I would have liked to have seen almost all of the footage glimpsed on the bonus features being used. Since as I've said, the flow of the movie was disturbed anyway, so more of it would have made no difference. So in the end this edit allowed me to appreciate even more why this film is so remarkable in the original cut and why I never grow tired of it's charms. Somehow to add to 'Dune' is also to take away something. However as you will notice I have scored this edit a 10 for enjoyment as it truelly is one of the best FanEdits I've so far seen. It allowed me to view a whole different side to the movie that the ugly Extended TV version could never do. I will be rewatching this for many years to come and will take a proud place next to my Theatrical Cut Blu-Ray. Thanks so much to PhineasBG and all involved for the time it must have taken to complete. If you hated 'Dune' you'll probably hate this even more but if like me you love 'Dune' then you HAVE to get a copy of this edit! It will allow you to see a whole different side to this world, meaning that you can go back and enjoy Lynch's cut even more!